All Blacks wing Hosea Gear's two late tries helped the Barbarians restore their tarnished reputation in a 39-29 victory over a youthful and enterprising England XV at Twickenham. The engaging non-cap international turned on Gear's second-half scores, with Mamuka Gorgodze, Benson Stanley and Juan Martin Hernandez also crossing for the invitational outfit. The Barbarians were roundly criticised after last summer's lacklustre 40-12 England defeat, with Sir Clive Woodward condemning their British and Irish Lions clash a "waste of time". However, there was not much to criticise about their performance on Sunday as Dean Ryan's men claimed the win. England fly-half Henry Slade bagged 15 points including a try, shrugging off a hefty first-half clattering from Rene Ranger to return and complete the contest with a healthy black eye for his troubles. Dave Ewers and Charlie Sharples also crossed for the England XV led by Jon Callard, with the senior stars preparing for the first Test against New Zealand on Saturday. Zimbabwe-born Ewers started proceedings, atoning for conceding a cheap early penalty by pounding through the Baa-Baas' flimsy fringe defence for the game's first try. Exeter fly-half Slade converted his club-mate's try to set England seven points to the good. Semesa Rokoduguni produced a powerful tackle on Ranger as the Barbarians found their rhythm, before Sharples forced Juandre Kruger into touch to stop a score. Stanley crossed after a smart pass exchange with outside centre Ranger, James converting to level the scores. Bath's Ollie Devoto came on for vice-captain Slade as a short-term blood replacement, quickly winning a ruck penalty that Elliot Daly converted for England to lead 10-7. Scything breaks from Daly and Rokoduguni carried England into the Baa-Baas' 22 once again, and Devoto's smart defence-turning grubber set Sharples home. Daly misjudged James' crossfield chip next however, allowing Gear to canter on and send full-back Hernandez over the whitewash. James posted the conversion to leave England ahead 15-14. Jamie Gibson was knocked out cold, colliding head-first with Joe Rokocoko's hip when trying to fell the All Blacks wing, and was replaced by James Gaskell. Daly indicated why he graced the Barbarians ranks last year, handing off Gear before chipping Ranger as England pressed again. 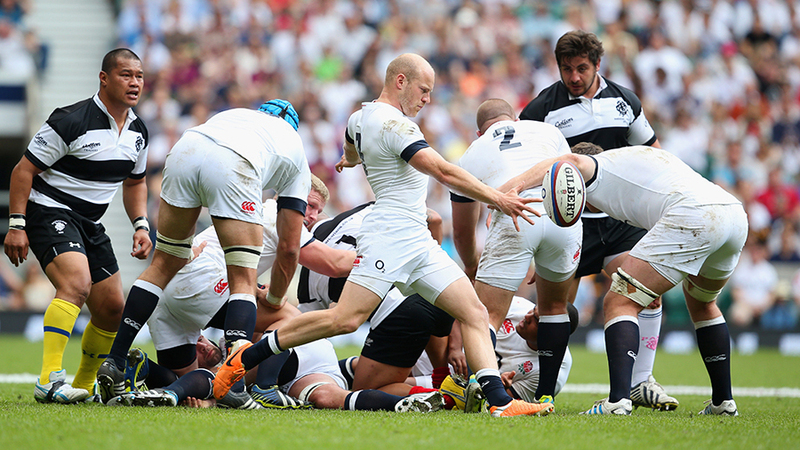 Slade slotted a penalty after England's attack broke down, to extend the home lead to four points. Exeter's young playmaker then pulled off a brave try-saving tackle on Ranger, who slipped and hurtled headlong into the unflinching Slade's midriff. England took that 18-14 lead into the break then, only for the Barbarians to wrestle it back when Gorgodze dotted down at full stretch. James converted the Baa-Baas' third try for a 21-18 lead, that he extended by three points with his first penalty six minutes later. England's replacements added immediate impetus, bursts from Devoto and Dan Robson carrying their side close. Slade skidded towards the whitewash and wriggled the ball onto the tryline, securing England's third score via Television Match Official confirmation. The Exeter fly-half struck the right-hand post with his tricky conversion, before Francois Trinh-Duc slotted a penalty to put the Barbarians 27-23 ahead. Slade landed his second penalty to cut England's deficit to one point, before smart breaks from Robson and Rokoduguni went unrewarded. The Baa-Baas punished England immediately, Gear outstripping the out-of-position Daly to romp home, with Trinh-Duc converting for a 34-26 advantage. Slade cut the Barbarians' lead to five points with his third penalty of the afternoon but, as England searched for a route back into the contest, the visitors struck again, Gear stealing his second try to seal the argument.